Wherever destiny takes you, in moments of clear vision, your first desire is to meet your co-nationals, to help you feel at home, even though you are away from home. You can do just that by looking to find the Church of your ancestors, by joining the Church community, where people get together as sons and daughters of the Loving Heavenly Father. The brothers and sisters from the East of Prut, living in California, made no exception when they left Bessarabia for the New World. They came to America with the urge to find an Orthodox Church. As they heard of the Holy Trinity Romanian Orthodox Church in Los Angeles, California, they wanted to integrate themselves into the life of this church. On the Easter Feast-Day 2007, they have decided to strengthen the unity among brethren by establishing a true brotherly communion. 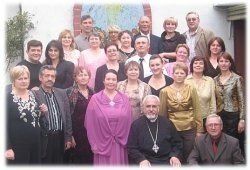 Thus, a group of 15-20 Bessarabians from Southern California have decided to establish a fraternal charity Foundation, under the umbrella of the Holy Trinity Romanian Orthodox Church on Verdugo Rd., Los Angeles. “The Christening” (incorporation) of this Foundation was done by V. Rev. Fr. Constantin Alecse, parish priest of the Holy Trinity Church, and spiritual advisor of the Foundation's membership. As the “Bastina” Foundation was established as a non-profit organization, the membership decided to start working for the welfare of the community. On Pentecost Feast-Day, Sunday 27th of May 2007, which is the Feast-Day of the Holy Trinity Church, the Bastina Foundation donated the church's Feast-Day banquet and, at the end of the event, held its first official meeting and elected the officers (click on “contact us” for the coordinates of the elected officers). Grigore Vieru ( February 14 , 1935 –) is a Moldovan poet and writer mostly known for his poems and books for children. He was born in the village of Pererâta, Hotin County, then part of Romania . His parents, Pavel and Eudochia Vieru ( née Didic) were engaged in farming. In 1957 he marked his publishing debut with a poems booklet for children. Romanian peasant icons have their important place in the history of the European art. Having major magical-religious significance in the past, today they kept mostly their decorative value. In the churches the icons are placed according to the ecclassical way of organizing the religious edifice. Icons are also placed in the chapels, outside the villages, in the trees or near the wells. The most important icons for the Romanian peasant?s life are those kept inside his house. They are usually placed on the Eastern wall or on the corner formed by the Eastern and Southern walls.